MY FATHER INVITED me down for the day and I had no plans, so I took the train to them, sitting in the sun the whole way, reading, next to an excited group of cricketers heading to the coast for a game. I bathed there with my book and looked forward to seeing everybody again, and feeling that the journey was one not towards home but an excursion. They were sat in the garden, on a blanket, drinking and kissing me hello. After my cigarette I washed my hands & mouth and kissed my niece. She climbed up on me, clasped at my clothes, gurgled, stared very hard and smiled her wet lips. I kissed her skull. Her hair was soft. There was fun & games with her; for instance, she would not leave the fabric of the blanket to wander out on to the grass. She did not like the feel of the grass on her skin. 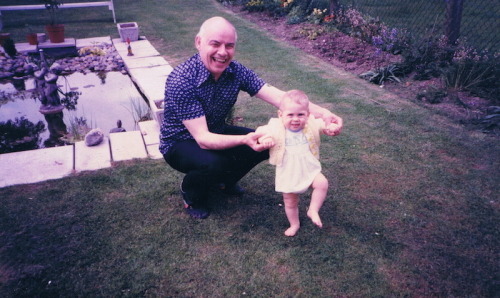 My mother told me—‘You were exactly like that… That photo of you and granddad in their back garden, you’re lifting your feet off the grass… You didn’t like it.’ I remembered the photograph. If we put my niece on the grass she either rested on her belly with her legs & arms in the air, or propped herself up off it as far as she could in some sort of tortured yoga pose. It was very amusing to me. I picked her up, held her to my chest, put my face against her. Terror filled me, so scared was I of dropping her or bringing her any harm, but still I held her, selfishly, because of how good I felt. Never before had I cared about children. Maybe once or twice there had been a child to whom I felt affected, but so far apart were our meetings that any friendship garnered between us was soon greeted by clouded looks of confusion at my attempts to hold them again. My niece feels no such confusion and always regards me with familiarity and affection, holding her arms out and sinking into my arms most comfortably. Frankly, it scares me. I did not ever think I would love something in the way that I love her. Even thinking about her now warms me up in a manner to which I am unaccustomed. Bringing her to mind, I think that I, too, could have a child someday, and that, above all, is what scares me. What if it did not work out between her mother and I? What if I cannot – or do not – love her as much as she deserves? What blame do I accept when life batters her, or to protect her from troubles, loneliness & heartbreak? It must be torture to watch the subject of your love suffer so. Yet still I hold her, worried I might drop her. Still she conjures up alien emotions in me, emotions I do not understand but that are all too good. She is wonderful and terrifying in equal measure. I am unused to such conflict. Before she leaves – and we not seeing each for five days – I hold her one last time; finally I can smell her on my fingers as I ride the train home and the sun sets gently at twelve minutes past nine.